Following the publication of Martin Coffey’s book ‘Tell Me A Story’ I had the great pleasure of meeting a cousin I didn’t know I had. The Sheridan family featured in two chapters of Martin’s book. 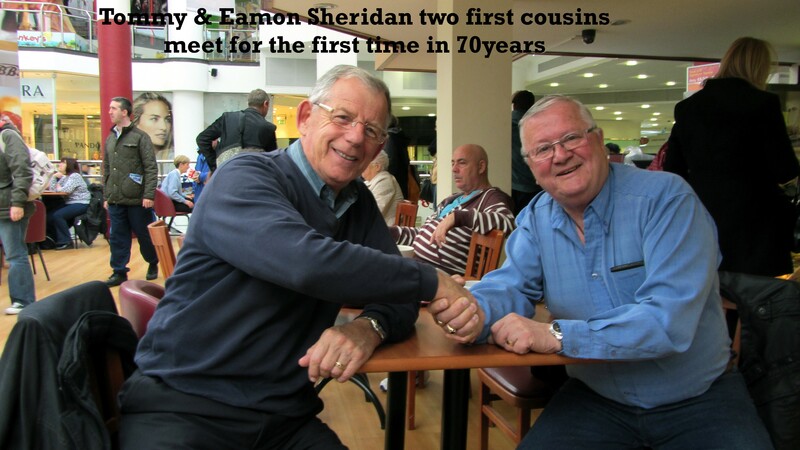 My long lost cousin, Tommy Sheridan contacted Martin and told him that there is a likelihood that the two Sheridan families may be related to each other. So through Martin and an exchange of telephone numbers Tommy and I spoke to each other for the first time in seventy years plus. 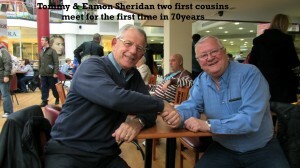 We arranged to meet each other and did so in the Square Shopping Centre in Tallaght. What we discovered is quite amazing to say the least. We actually went to the same school, Saint Finbar’s but never knew each other. What’s even more bizarre is that we only lived a relatively short distance from each other. I lived on Mulroy Road and Tommy lived on Ventry Park in Cabra West. How strange it is and sad also that we grew up within a short walk of each other and never met. I’m delighted to say however that whole situation has been rectified and we are now in regular touch with each other. We have exchanged Family History details and will endeavour to organise a ‘Clan Gathering’ in the near future.